Published in association with the Scottish Mining Museum, Mining the Lothians features many photographs from the museum's extensive collection. Like Stenlakes other mining books, this one covers every aspect of the lives of the miners and their families, including the explosive demolition of Monktonhall's winding towers, rescue teams and aerial ropeways, pug locomotives, coal cutters and female coal pickers. 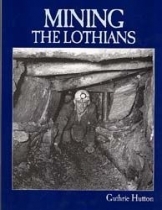 Away from the pit, football and cricket team photographs, colliery bands and miners' rows provide a full picture of life in a coal town Several pages are devoted to the West Lothian shale mining industry.